Disclosure: This is a sponsored post written by me on behalf of Eckrich Smoked Sausage. On The Go Sausage Potato Salad Jars can be made quickly ahead of time with staple ingredients and conveniently transported anywhere you go. A must for picnics and summer road trips! Picnics are a must for my family, especially in the summertime, and so are summer road trips. We’ve enjoyed several, and along with them have really appreciated great food on-the-go due to its ease of transport, and how they take so little time to make! 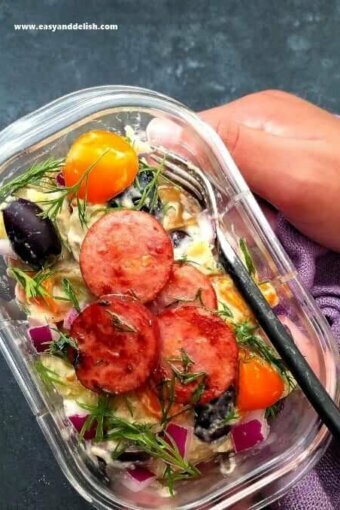 A favorite gluten-free dish of mine that can be carried along is my On The Go Sausage Potato Salad Jars. You can go from Hmmm to mmm with these are a quick, yet complete meal that can be prepared ahead in 30 minutes, refrigerated, and transported anywhere you go. They use staple ingredients widely available at local supermarkets such as potatoes, light mayo, lemon, seasonings, olives, a couple of vegetables, dill, and Eckrich Polska Kielbasa Skinless Smoked Sausage (found in the Deli section) — which is naturally hardwood smoked and crafted with just the right blend of spices for a truly rich, savory taste. Eckrich Smoked Sausage comes in wide variety of flavors and forms, including rope and links, making the perfect go-to ingredient to make a quick, delicious meal for your family or a crowd. That way you can spend less time in the kitchen and more time with your family. 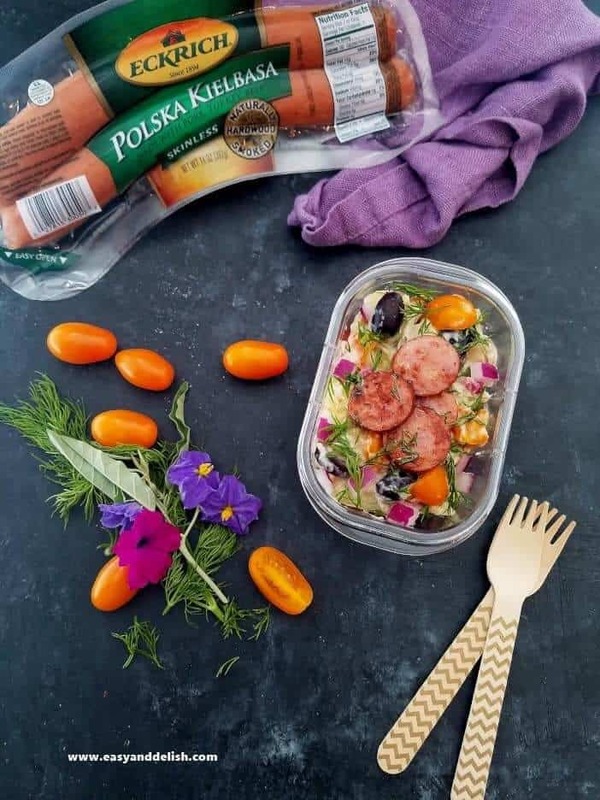 We used Eckrich Polska Kielbasa Skinless Smoked Sausage to make our tasty sausage potato salad which was highly rated by my picky eaters… so now you know. For your next summer trip or a fun lunch picnic, make and take these jars with you and see for yourself how they will be a hit. 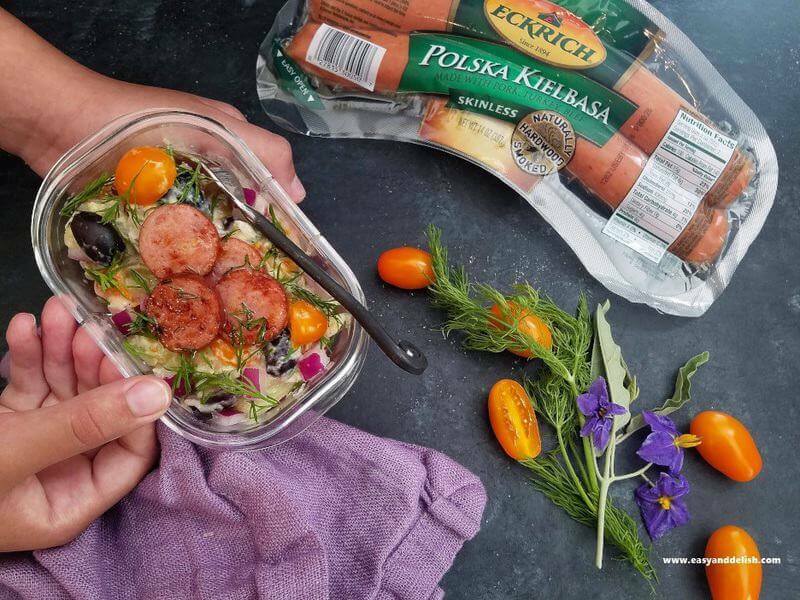 For more info about Eckrich Smoked Sausage, as well as quick and easy recipes — such as our On the Go Sausage Potato Salad Jars– visit www.eckrich.com. Heat a non-stick skillet over medium-high heat, add vegetable oil, and brown the Eckrich Smoked Sausage on both sides (about 4 minutes). Remove from the heat and place on a plate lined with paper towel. Set aside. Meanwhile, place potatoes in a pot with salted water and cook over high heat for about 10-15 minutes or until tender but still firm. Drain, cool by running under cold water, chop, and then mix with mayo, lemon juice, salt and pepper, garlic powder, Dijon mustard, dill, olives, and vegetables. 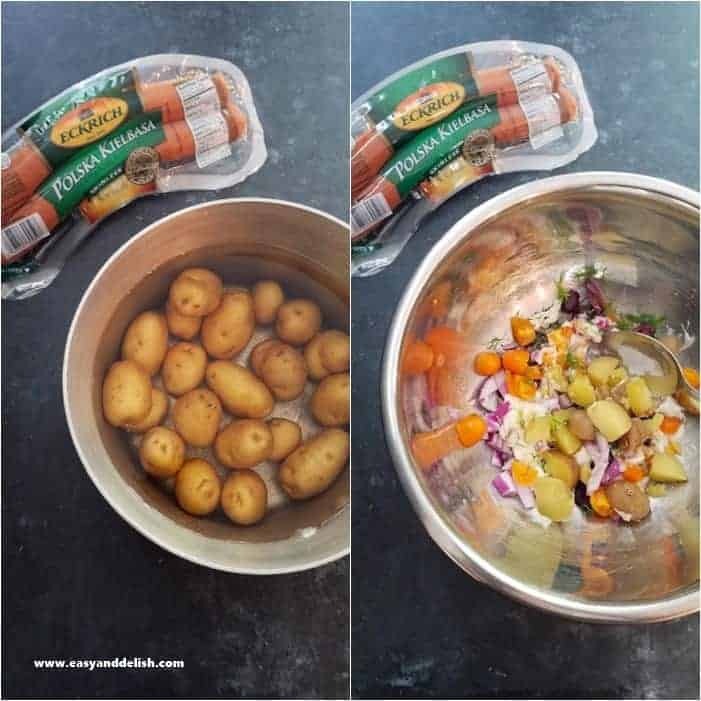 Spoon cooked sausage into jars, top with a layer of potato salad, and add more sausage. Close the jars and refrigerate until serving. On The Go Sausage Potato Salad Jars can be quickly made ahead with staple ingredients and conveniently transported anywhere you go. A must for picnics and summer road trips! Place potatoes in a pot with salted water and cook over high heat for about 10-15 minutes or until tender but still firm. While potatoes are cooking, heat a large no stick skillet over medium-high heat, add oil, and brown the sausage on both sides (about 6-8 minutes). Remove sausage from the skillet using a a slotted spoon and place sausage on a plate lined with paper towel. Set aside. Drain, cool by running under cold water, pat dry, chop, and then mix with mayo, lemon juice, seasonings, Dijon mustard, sugar, dill, olives, and vegetables. Spoon cooked sausage into jars, top with a layer of potato salad, and add more sausage. Close the jars and refrigerate until serving. Enjoy! Sausage Potato Salad must be stored in the refrigerator until serving. Leftovers can be refrigerated for up to 3 days. This is a sponsored post written by me on behalf of www.eckrich.com. This is such an amazing idea! Who wouldn’t love an on-the-go potato salad…that too with these delicious additions. So good! Thank you my friend! It can be conveniently made a ahead and carried anywhere one goes such as work and road trips. It was delicious too! What a great idea and so hearty! Perfect for any trip. My MIL always said that Eckrich was the best! 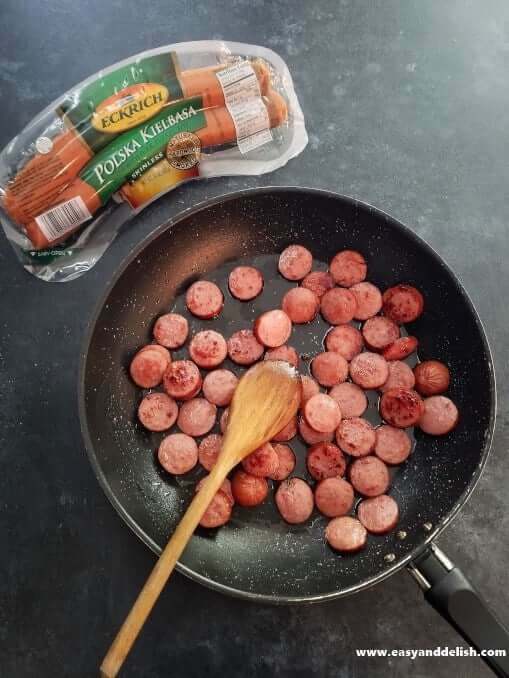 I love their Polska kielbasa sausage. It is full of flavor and goes well in many dishes.